The master’s degree, in close collaboration with the students, works so that the documentaries circulate in national and international festivals. Below are the mentions and prizes obtained. → Selection Catalogue SHORTCAT 2019. Catalan Films. → Selection Catalogue SHORTCAT 2018. Catalan Films. 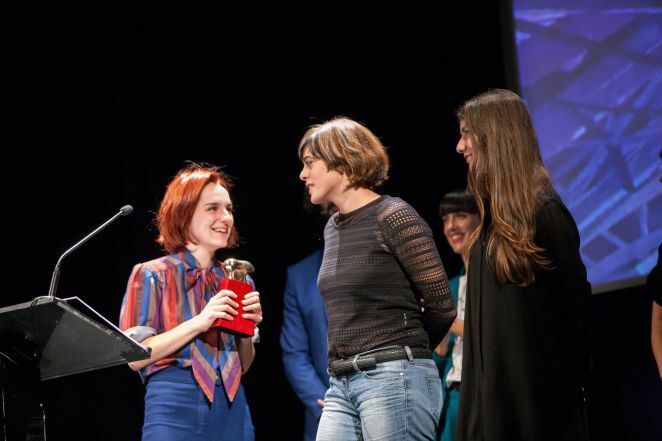 → Videolab Award to the Best Short Film of Spanish Production. Mecal Pro|International Short Film and Animation Festival of Barcelona, 2018. → Audience Award. Mecal Pro|International Short Film and Animation Festival of Barcelona, 2018. → Best Documentary Short Film of the Extremadura Documentary Film Festival Extrema’Doc, 2008. → Jury Award for Best Documentary Short Film and Public Award for Best Documentary at the Latin American Film and Video Cinesul Festival, 2009. → Special Mention of the Jury in the Section Short Films of Alcances Muestra Cinematográfica del Atlántico 2009. → Best Screenplay Award, New Author section Sitges International Film Festival 2007. → Award to the Best Documentary Short Film in FESAALP, Festival de Artes Visuales de La Plata, Argentina, 2008. → Special Jury Mention in the Alcances Short Films Section. 2008 Atlantic Film Festival. → Second prize in the short films section of Jaén Documentary Film Festival, 2008. → Best film in the Film Schools section of the Memorimage de Reus Festival, 2008. → Best Documentary Award at the Girona Film Festival 2005.